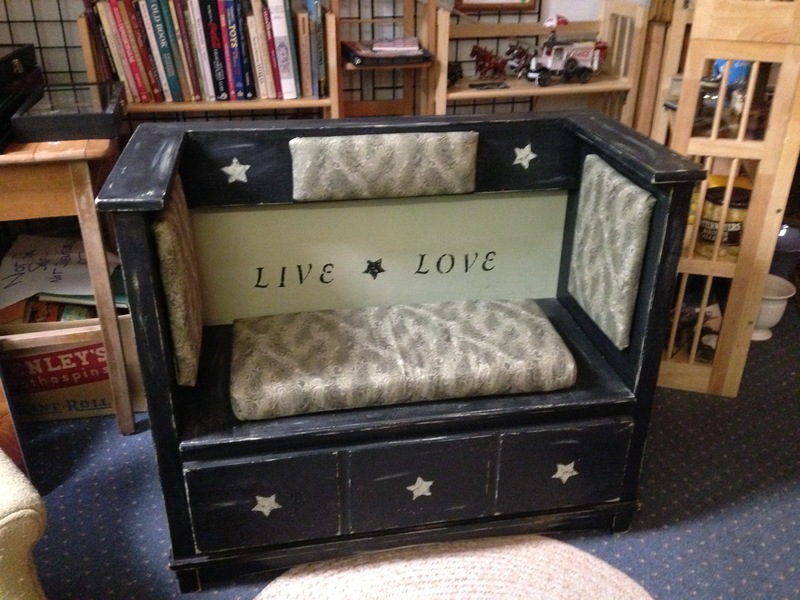 A Maine craftsman created this very cool Live Love Settee (and the wonderful Pet Beds which you can find here: https://heritagecollectiblesmaine.com/2016/04/13/pet-beds-from-repurposed-vintage-furniture/). For the new price, keep on reading until you get to the “Price” section below, then come on in and check the settee out in person! 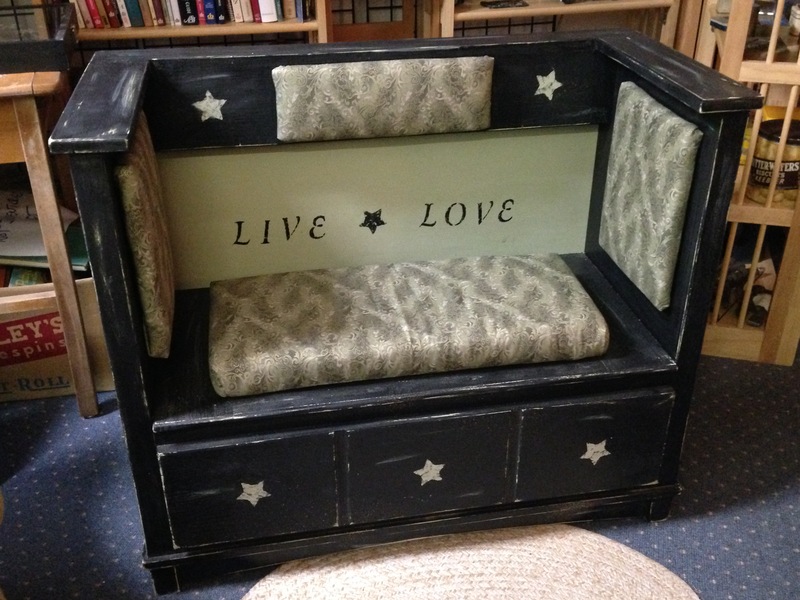 So I get an email from this guy who asks “Would you be interested in selling this hand-made settee from a repurposed old dresser?”. Are you kidding?? YES! It’s absolutely wonderful! 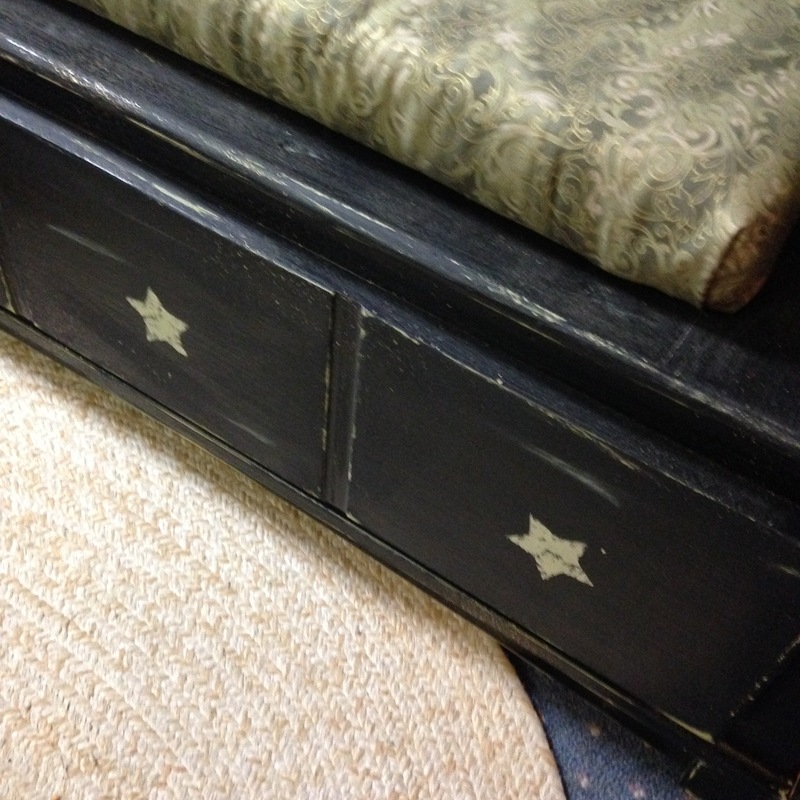 This is what we’re all about… finding new uses and homes for quality older materials, offering art & treasures for everyday life, pricing things fairly, supporting others in improving their lives and/or building their businesses, and wherever possible reducing our own carbon footprint on this earth. 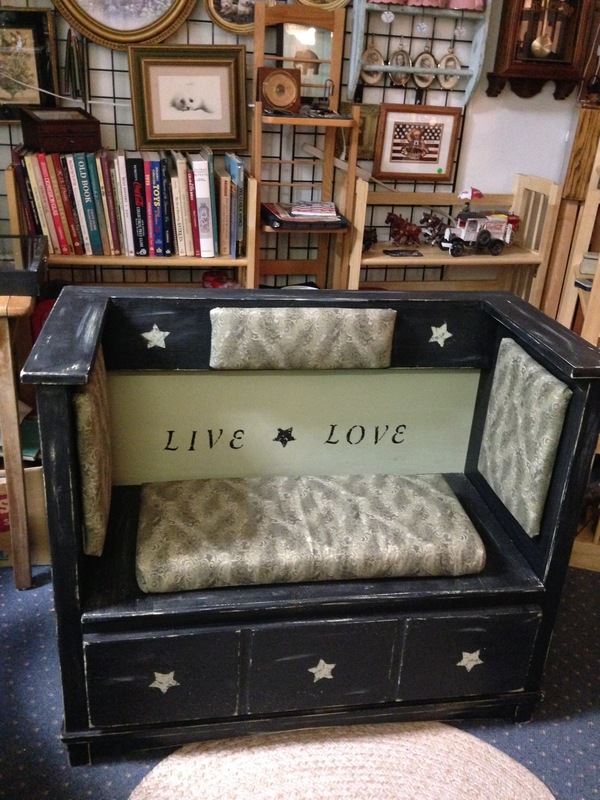 The Live-Love Settee meets all of those criteria! Better yet, it’s absolutely beautiful! 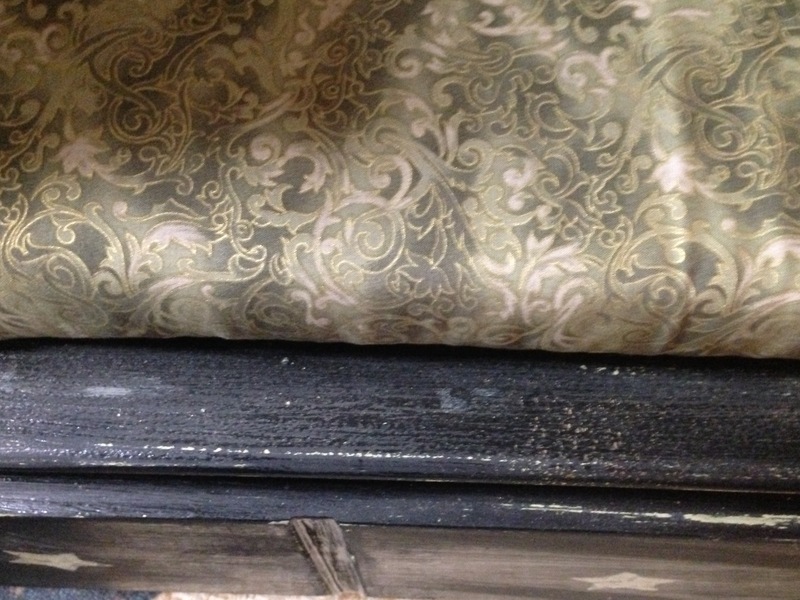 The settee was created from an old dresser which was two-layer painted, then distressed with gold flecks added to accent the green & gold in the fabric. 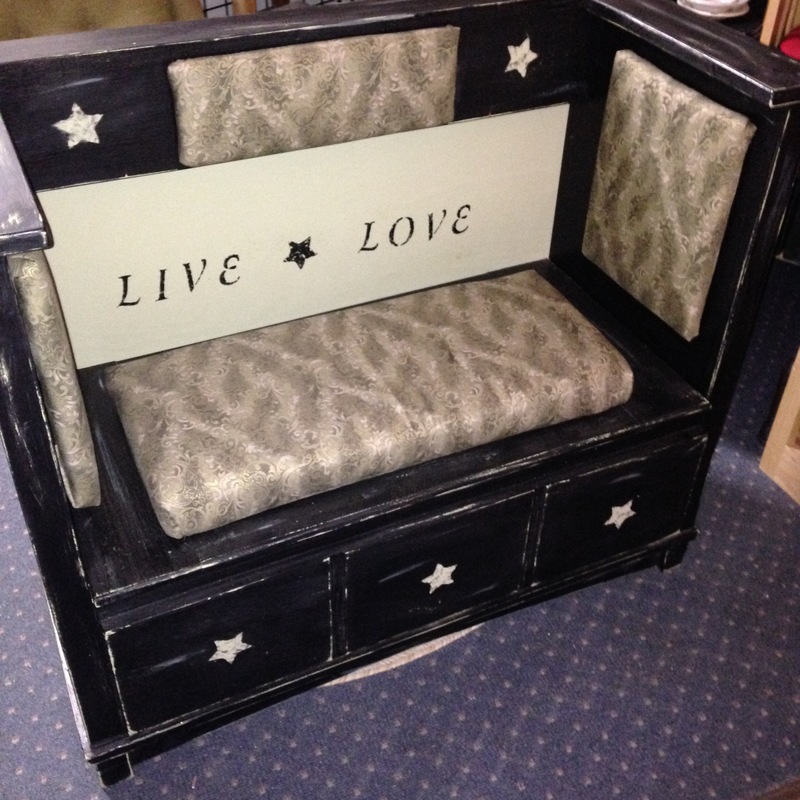 It has rustic stencil work, and the seat even hinges, giving a nice storage space inside! 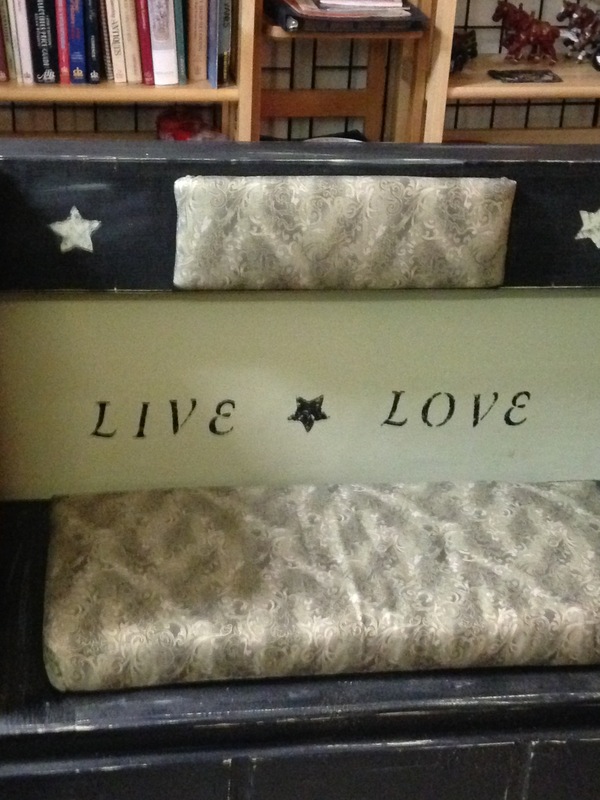 This is a one of a kind piece, created by a Maine artisan who, after a few decades as an adult in an adult job, seems to have found his artistic calling. 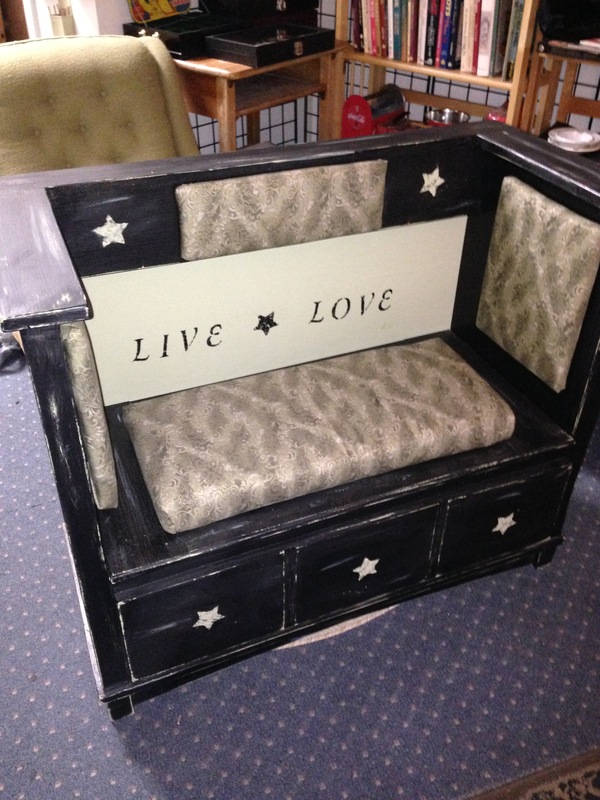 We are very excited to have this and other work of his in our shop! 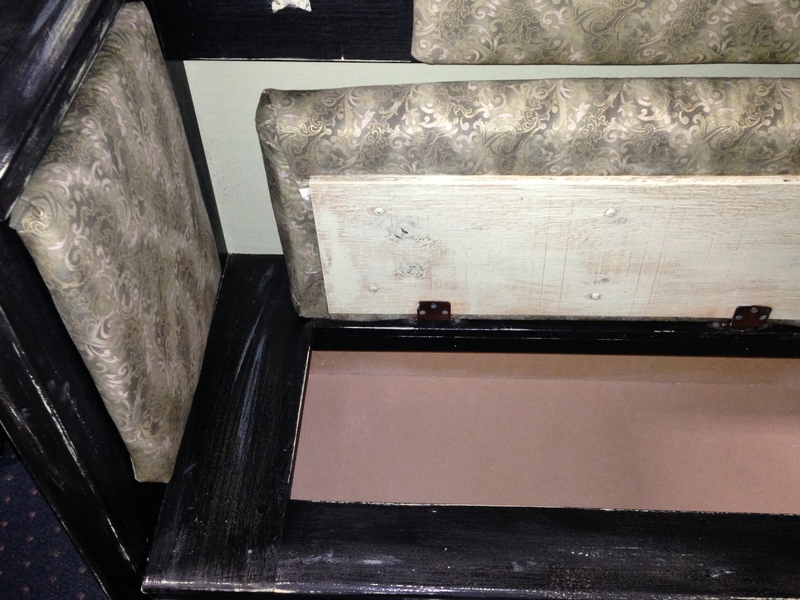 Condition: The settee is in perfect condition. 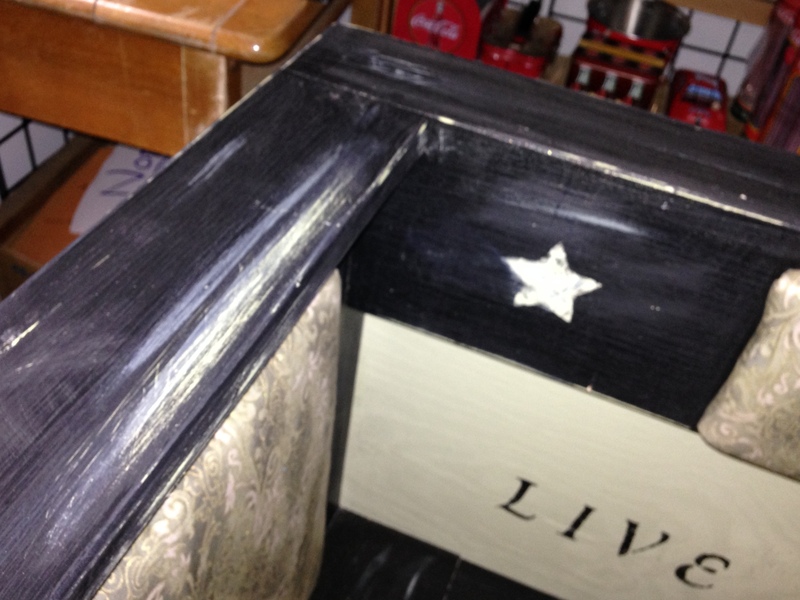 It was intentionally distressed to give it that primitive farmhouse look and feel. 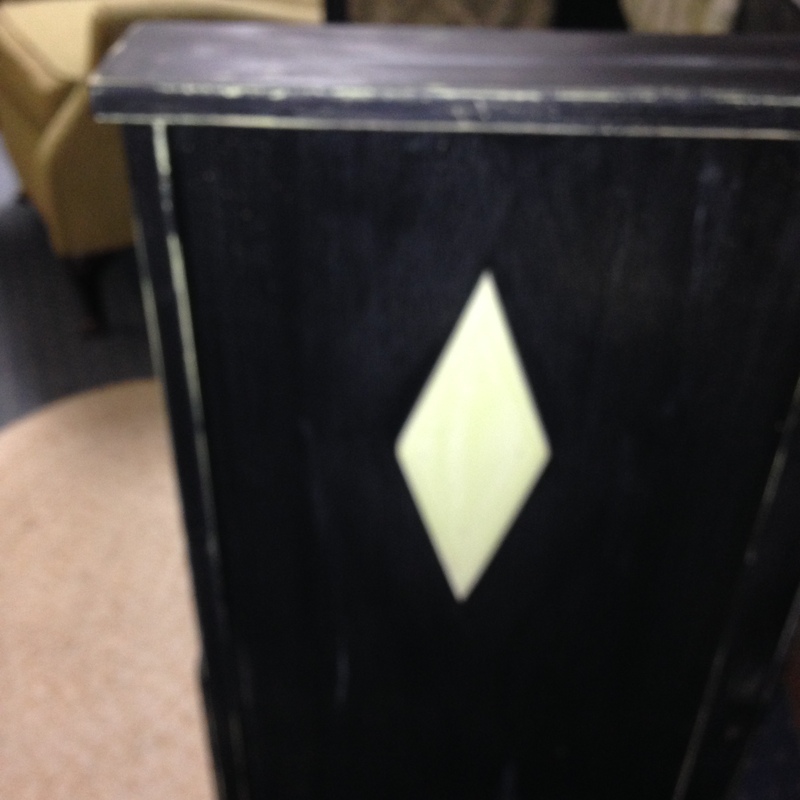 Dimensions: Approximately 38 1/2″ W x 18 1/2 D” x 33″ H.
Price: Was $248.00. 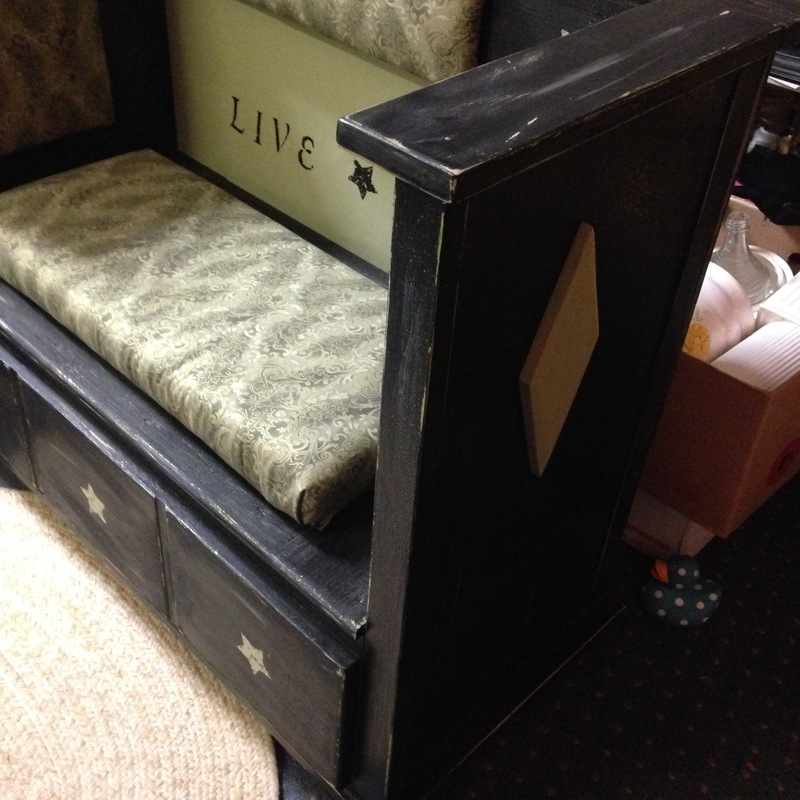 NOW JUST $195.00! Maine State sales tax of 5.5% applies. Location: Den of Antiquities, 1399 Bridgton Road, Westbrook ME 04092. We are booth # 56! 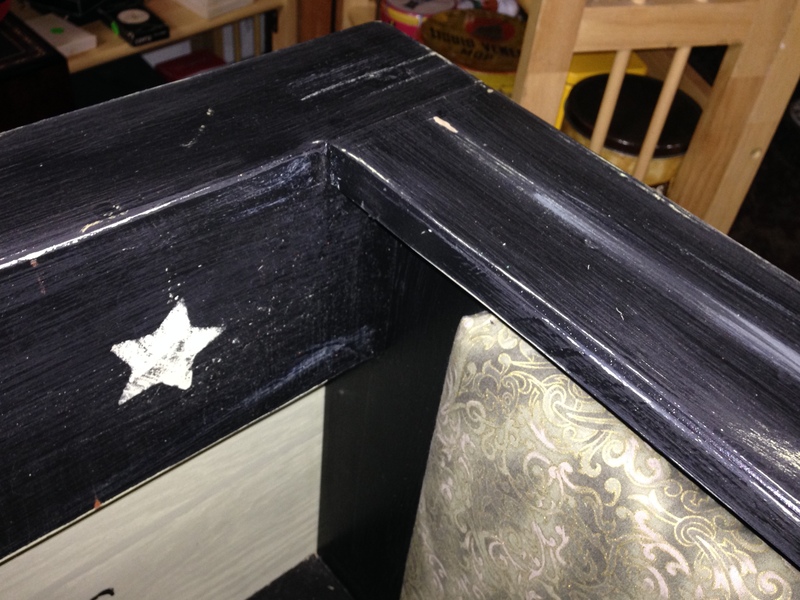 (We’ve recently reduced the number of other locations from 5 to just 2 for the time being; getting to all of the other shops in addition to our full-time social work job was just a bit much for me.) 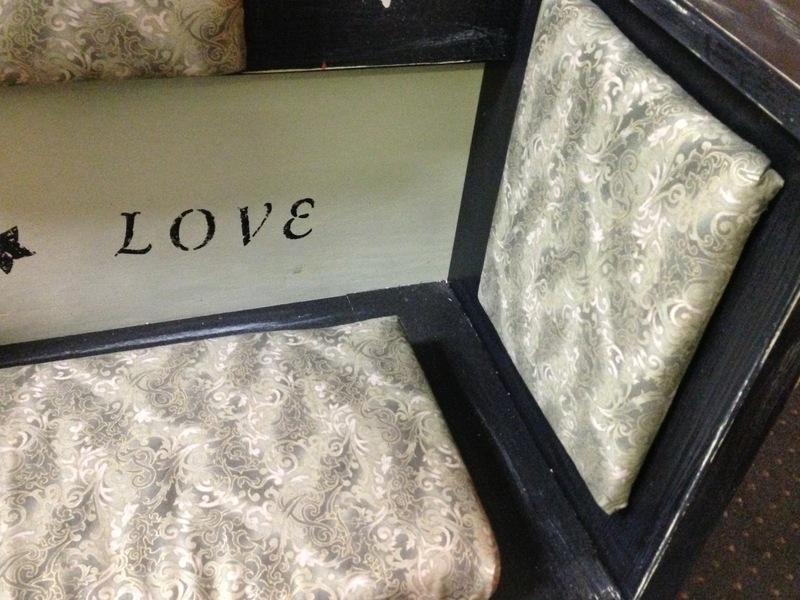 We hope you will enjoy our booths at those locations as you did our shop on Main Street. Just turn off Main Street in Lewiston onto Park Street and park in the first available parking spot. The entrance is through the door at the end of the building on the right hand side. You’ll see signs in the windows (“Retail Store” and “Heritage Collectibles” and “Antiques” as well as others; you’ll also see my silver Jeep Liberty parked there. Our “Open” flag should be out, too – or perhaps Johnny’s favorite black & white pirate flag! Just knock on the industrial looking door; we’re glad to see you! Thank you to everyone who has supported us for the past four years! 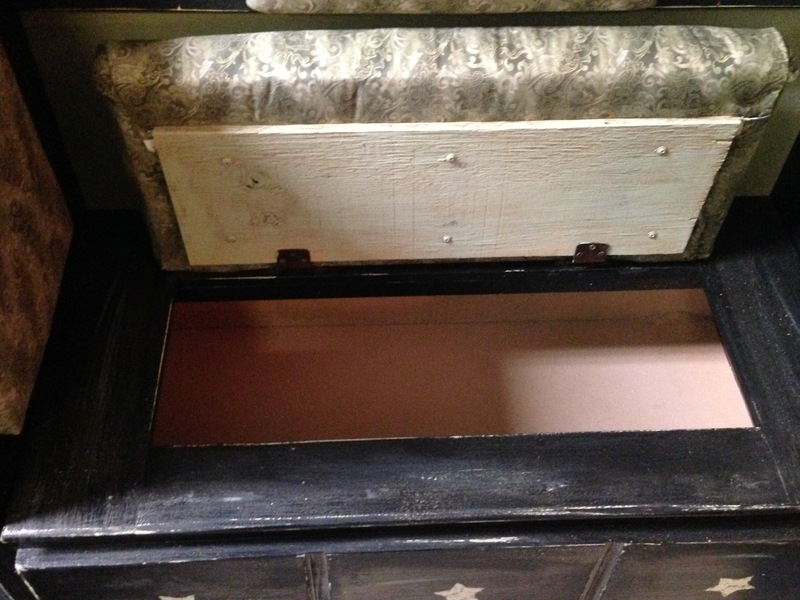 This entry was posted in Furniture - Primitive & Farmhouse, Primitive & Farmhouse Decor and tagged country settee, distressed furniture, handmade furniture, live love, maine artisan, maine furniture, Maine made, primitive furniture, primitive settee, repurposed furniture, repurposed materials. Bookmark the permalink.